“Since I’m working today, I’ll have to skip his fight. Duty comes first. Anyway, there is a replay, so it’s Sinulog for me for now. If I didn’t have to work, for sure I’ll be watching the fight,” the policeman said in Cebuano. The same was true for the 79- year-old Pacquaio fan, Pino Magsaysay, who hails from Pinamungajan, Cebu. “I know he has a fight right now. He’s also from Pinamungajan, you know, but what can we do? We’re celebrating a fiesta. This is our devotion to the Sto. Niño, so this should come first. I’ll just pray that he wins,” he said. 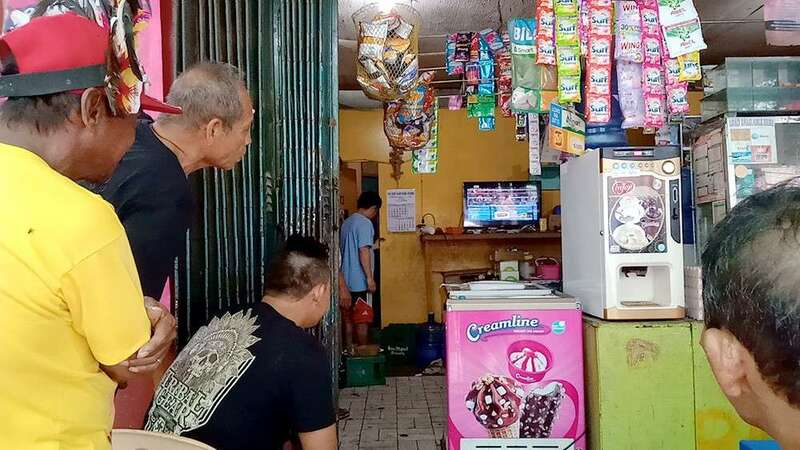 Pacquiao fans Jesus Saberon, 52, and his wife Rachel were fortunate to have stopped by a sari-sari store that streamed the Pacquiao-Broner fight. “I’m thankful for being able to rest here and watch it live,” said Jesus. To watch the Pacquiao vs. Broner fight, one could just download an app that offered free broadcast of the boxing match in their mobile phones. However, downloading the app required the use of mobile data connection, which could not be done on Sunday due to the signal shutoff that the National Telecommunications Commission implemented for the duration of the parade. Three years after the signal shutoff during the parade was first implemented, revelers and some dancers said they had already adjusted. Alljun Bohol, 18, member of Tribu Tinabuay of Placer, Surigao del Norte, said that although the signal shut off caused some inconvenience, he understood its purpose, which was to help authorities secure the public. “It’s difficult if you’re not familiar with Cebu because you don’t know how to find your way around the city or if you need to look for somebody. But it’s okay. We were told about the shutoff in advance so we were able to adjust,” Bohol said in Tagalog.